Address: 3506 Rose Hill St.
Morgan Dollars and Peace Dollars! 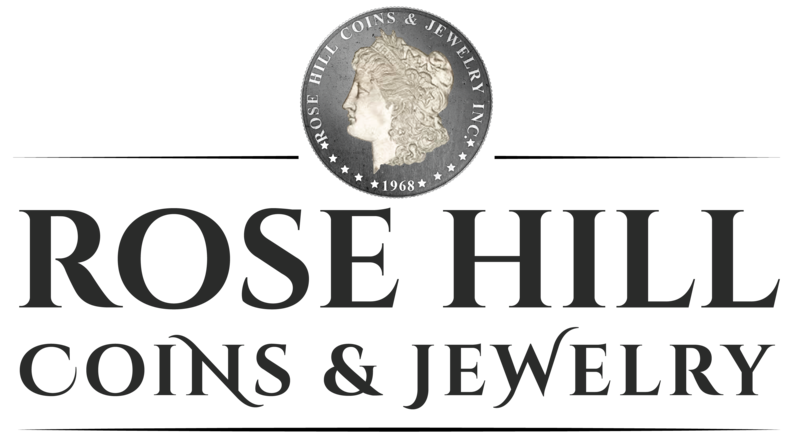 Rose Hill Coins & Jewelry, Inc.
Rose Hill Coins & Jewelry has been family owned and operated in the same location for nearly 50 years. We buy and sell collectible coins, paper money, precious metals, tokens and medals. We also carry a complete line of collector supplies. *We buy and sell loose diamonds, gold, platinum and sterling silver fine jewelry. We offer both new and previously owned jewelry at up to 70% off retail prices. We are aggressive buyers of all gold, silver and platinum scrap jewelry. *We are one of the largest dealers of metal detectors and recreational mining equipment in the Treasure Valley. We are authorized dealers for Keene, White's, Fisher, and Garrett detecting and mining products. We invite you to stop in and let us help you with your collecting pursuits, precious metal/bullion needs, or your next jewelry purchase. Copyright © 2019 Rose Hill Coin and Jewelry, all rights reserved.